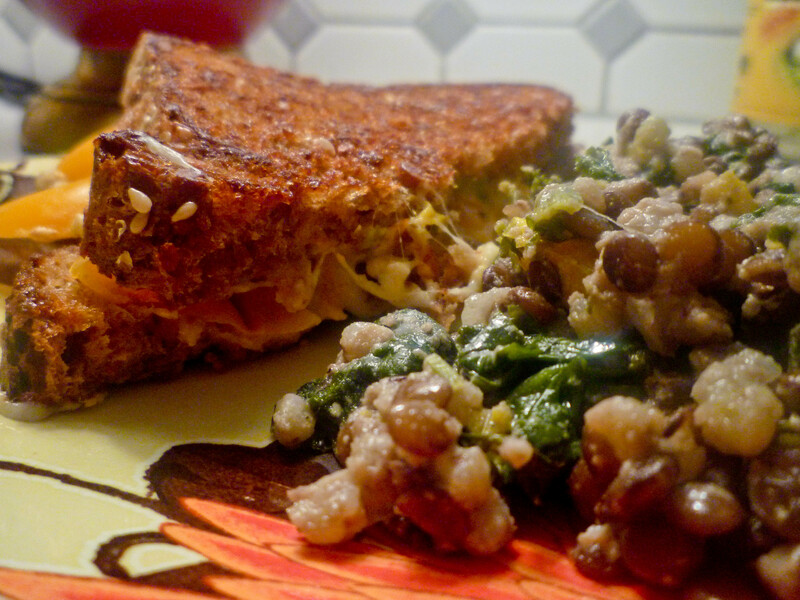 Thirty-Five with a Chickpea Sandwich…for Jill. I am thirty five. I can’t believe I am thirty five. While vacuuming, obsessively pondering and churning with emotion of this realism, I thought about all the others before me, who have been thirty five at some point in their life. Did they have these feelings of vacancy, grief, or even disbelief? I am sure they have and did, some must have! However, as I continued vacuuming up all the million particles that can end up on one’s floor, I started to ask myself if I would want to hang out with someone like me who was not so excited about aging. The truth is, no I wouldn’t. I wouldn’t want to hang out with me and the moodiness of self-pity that I have pulled, like a blanket from a linen closet to wrap my whiny self in. I would want to be alongside with someone who embraces age with every wrinkle, spot, and limitation. I would want the atmosphere around me to be lit with excitement and hope, adventure and awe, of the amazing, fruitful things that can only be revealed through time and grace. I made a commitment to myself, this afternoon, vacuum in hand, which I will no longer stretch the truth about my age, telling people I am 28, when in actuality, I am thirty five. It is time to stop this nonsense of the stunted growth syndrome, and be the age appropriate woman I really am. To age or not to age, is no longer the question. I am aging. I feel like I need a buy a cake with a cape on it to symbolize the breaking out of the old self into the new self, like the way a superhero breaks forth with force out of the restrictions, bondages, and restraints from his oppressors. It is a new hour, a new day, and a new challenge, one in which I will do with acceptance, grace, and forbearance. As I no longer mourn being thirty four, but rejoice in being thirty five, I have prepared for myself a sandwich filled with nutrients, freshness, and promise. My life is no longer what I don’t have, but what I do have. Toasted bread crackers tortillas or lettuce for serving. In a large bowl, mash chickpeas until they are flaky in texture. 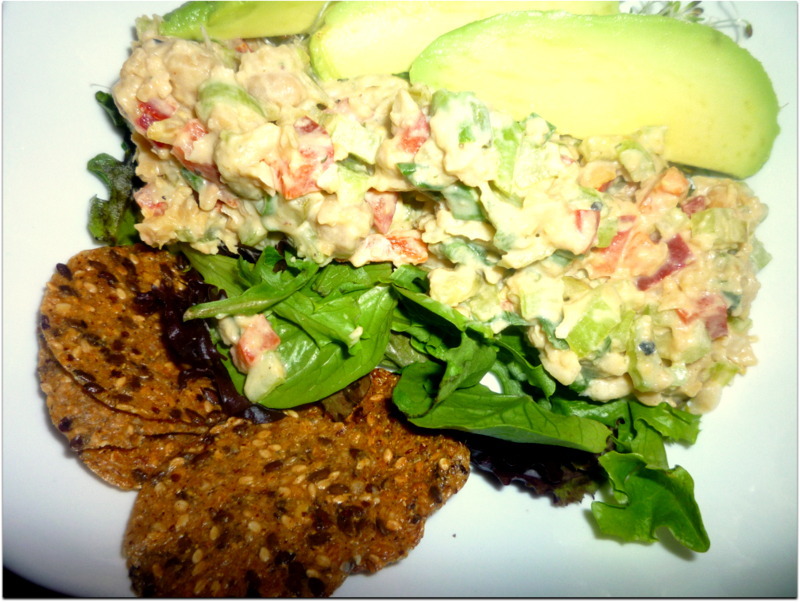 Add remaining ingredients and serve with toasted bread, crackers, or lettuce. 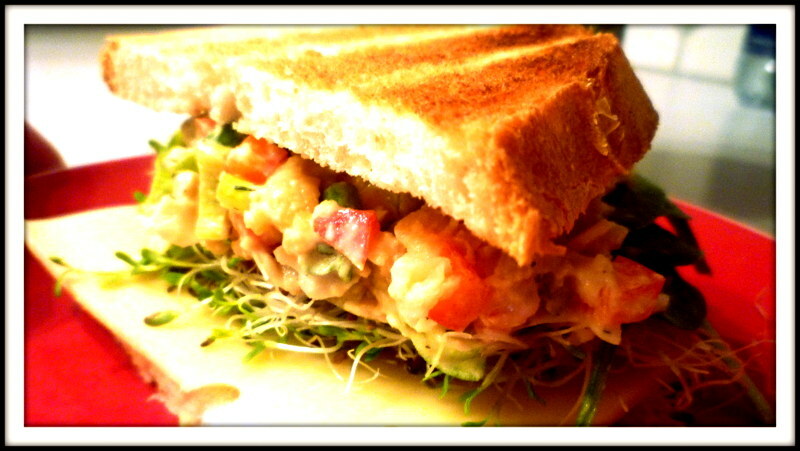 I loved it with spinach, sprouts and avocado! MMMMMMMMMMMM so good!!! I remember one day in school, when I was a sophomore, student counsellors met with us to look over lists of colleges, universities, and other means of higher education. I felt pressured and trapped. It was way over my head. At 15, how was I to know what I wanted to be? I only wanted to play soccer and garage sale. I wasn’t big on school to begin with, so to think about post secondary school after secondary school, discouraged me. Grades intimidated me. Peers scared me. I remember saying to my friend as we were checking off random schools to go to that it would be fun to own of a sandwich shoppe. I loved sandwiches and I still do, however, I also love to make sandwiches. It has become a family tradition to go to the grocery store and buy fresh buns, cheese, and meats, for our lunches, after church. This Sunday I wasn’t able to go to the store due to a prior engagement. Therefore, I decided to use what I had in the kitchen, and yes, this included Sean’s least favorite thing in the world, the big L word, LEFTOVERS. I ended up making a grilled avocado and orange pepper cheese sandwich with Oh She Glows’ “Lightened Up Protein Power Goddess Bowl” leftovers. It was pretty yummy. In a medium size skillet, heat the olive oil at a medium temperature until warm. Place the slices of bread in the oil. I like to have both sides of the bread covered in the olive oil so flip them over before adding the remaining ingredients. 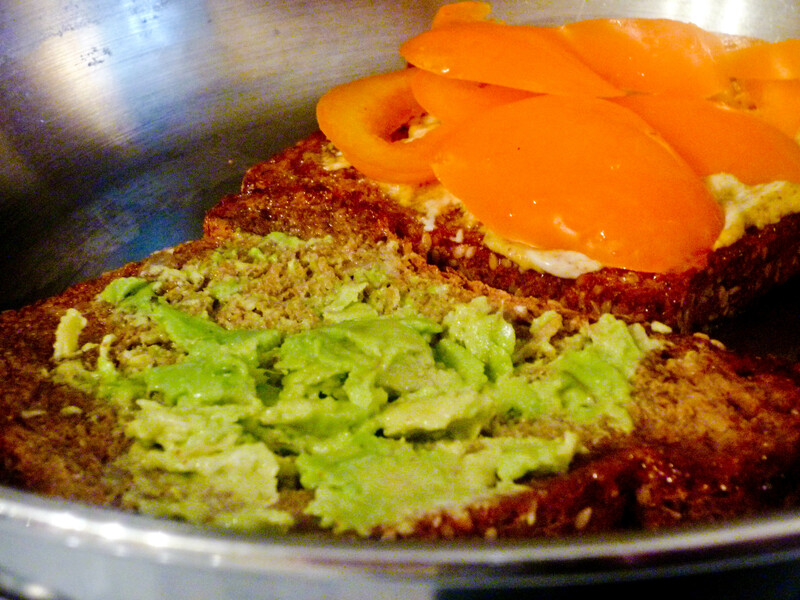 Spread 1/2 of an avocado on one slice of bread and mayonnaise and mustard on the other slice. 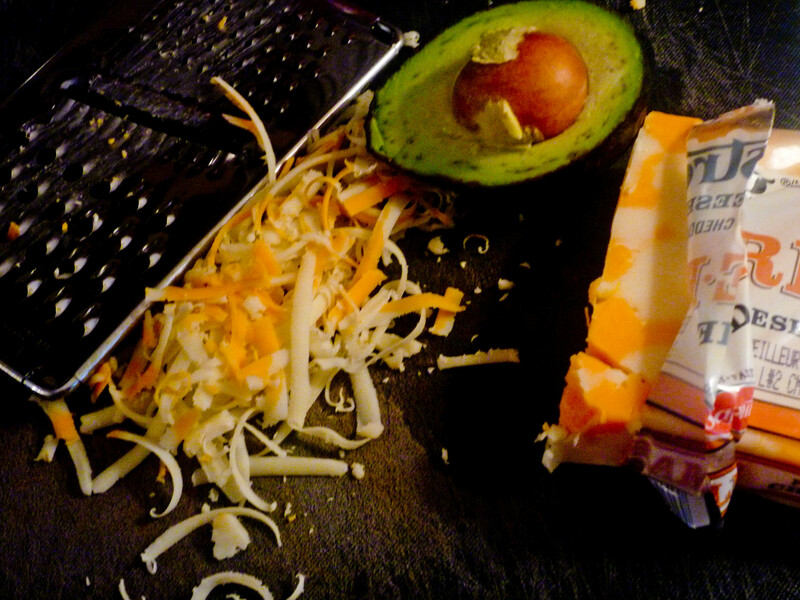 Gently place the pepper slices over the mayonnaise and the cheeses on the avocado. Bring the two slices together and with a metal flipper press down hard on the sandwich and then bring the temperature to a low heat and cover for about 2-3 minutes. Flip the sandwich to have the other side toasted and again press down really hard with a flipper, and cover again for another 2 minutes. 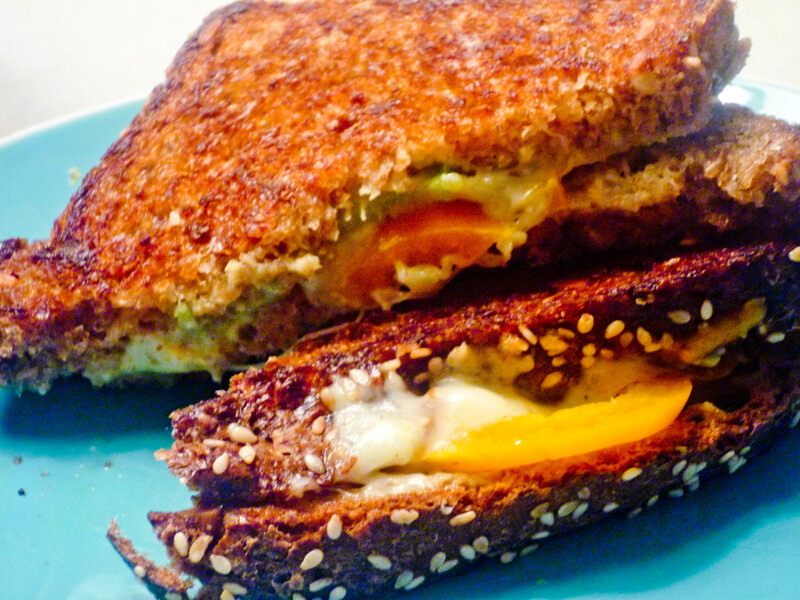 When the peppers are warm and soft and the cheeses have melted, the sandwich is finito. Serve with a salad, carrot slices, or tortillas. 1. Cook lentils and buckwheat according to package directions. Drain and set aside. 3. In a large skillet over low-medium heat, add olive oil and sauté the chopped onion and minced garlic for a few minutes. Add in the chopped red pepper and tomato and sauté for another 7-8 minutes. 4. Stir in the chopped kale or spinach and sauté for another few minutes, just until tender. Stir in the full batch of tahini-Lemon dressing, the cooked & drained grains and lentils, and simmer on low for another few minutes. Remove from heat and stir in the minced parsley. Season with salt and pepper to taste and garnish with lemon wedges and zest. 1. In a food processor, add all ingredients and process until smooth.